This evening, the Seer -Varisai of goddess Karpagambal was taken to Sri Kapali Temple for Thirukalyanam in a grand procession. The members of Thirumayilai Ulavara Thirupani Kulu Sangam carried them after a pooja at Chellapa Caterers’s house in Pitchu Pillai Street, Mylapore. They have been arranging the seer-varisai for Ambal since the past 10 years. It had a valaipoo (banana flower) kalasam.”Usually, coconut is kept over the kalasam. But this is our silver jubilee year. So we thought we should do something different for ambal,” says Sainath Prabhu, a member of the Sangam. Killi jadai, Thirumangalyam, silver kolusu, metti, gold mookuthi, silver poonal for Sri Kapaleeswarar, sarees, blouse materials, alangaram items, varieties of garlands, flowers and fruits were among the seer-varisai given for goddess Karpagambal. 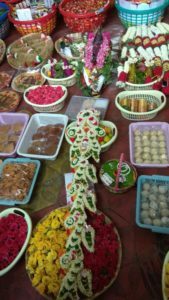 Around 3000 tamboola pai with coconut, banana, betel leaves and nuts, manja kairu (yellow thread),manjal and kumkumam were also present. “After thirukalyanam, these will be distributed to the devotees,” he says. Thirukalyanam took place today at around 8.45 p.m., after which an oonjal sevai took place for Sri Karpagambal and Sri Kapaleeswarar. Later, after veedi ula a small pooja will take place at the Kodimaram and the kodi (flag) will be brought down by the priests. All the four Mada streets were congested with traffic as hundreds of devotees were arriving at the temple to witness the holy wedding. Today, many more hawkers had put their shops at North Mada Street and Kapaleeswarar East Tank Square Street since it was the Thirukalyanam day.